I have heard a lot about the new products out there containing prebiotics and wondered if they tasted good. I love to be healthy but hey its gotta taste good too! Thankfully I had one of my readers tell me about a company Monkey Brains. They make Oatmeal and Granola Bars. 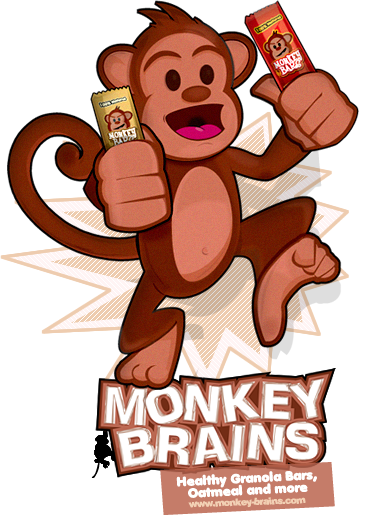 Monkey Brains products do not contain HFCS, preservatives or additives, basically its real food! 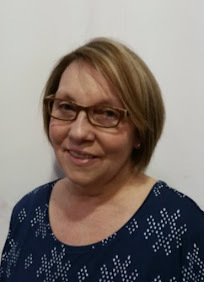 We had the opportunity to try all the products they make and we loved them. Of course we each had our favorites in the house. The fact that the logo is a wild monkey made my husband and I laugh since our little boy is one. We have monkey costumes, monkeys on his clothes, a monkey pillow pet and his favorite fruit is bananas. I knew these snacks were for us! After I took this I cut up into tiny pieces for him to enjoy. We first tried the Monkey Granola Bars. We had them for dessert the night they arrived in the mail. My son LOVED the blueberry vanilla bars. He ate one and guzzled down some milk and gestured for more. Thankfully the bars are low in sugar so I could have one of each and my favorite was the Banana Peanut Butter Chocolate. It was so good! My husband thought they were a little rich and said they should make a banana nut flavor. He liked the Strawberry Vanilla the best. Good thing they make different varieties since we all have such different taste preferences in our house! As I type this review my son is munching on a Strawberry Vanilla Bar and it smells so good! The next morning for breakfast we enjoyed Monkey Brains Oatmeal. Again I made one of each so we could all see which ones we liked best. My little boy is a great little review since he wanted more of some flavors and others he did not want more of. Of course he loved the blueberry oatmeal, he eats everything blueberry! Suprisingly he liked the Raspberry flavor, he usually won't eat raspberry anything. I liked the Maple Brown Sugar Oatmeal the best and have had it for breakfast everyday this past week. My husband agreed with out little guy on blueberry being his favorite oatmeal. I gave a sample pack to my mother in law and she enjoyed all the strawberry ones the most. The best part is I can tell my son not to monkey around when he is eating them, it seems to crack me up so much. 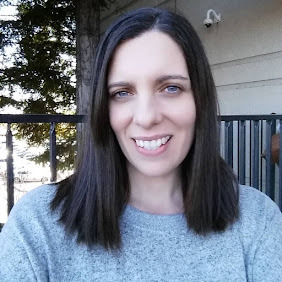 Thankfully I tossed a few bars into our diaper bag because we were out and about yesterday and I was getting a headache from not eating enough and after one Monkey Bar I was feeling better and was able to continue on our errands for the day! 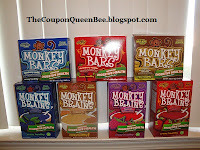 I would recommend getting these tasty snacks and oatmeal for the little and big monkeys in your life! 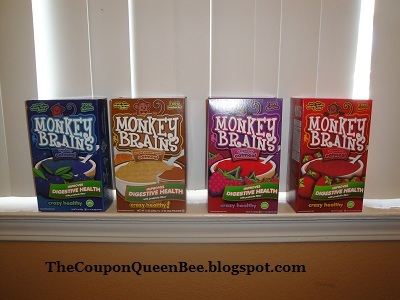 Monkey Brains offers a sample pack on their website with one of each of the granola bars and oatmeal flavors for $1 plus the cost of shipping. A great way to try it before you buy a whole box. 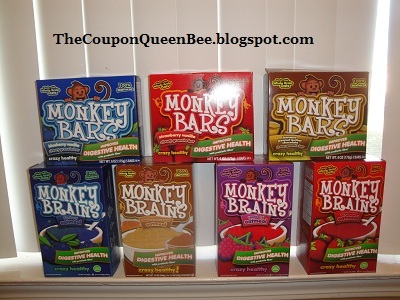 You can find Monkey Brains Granola Bars and Oatmeal at Whole Foods, Krogers, Food Lion and online at their website. They are coming soon to many more stores. If you shop online you can save 10% on purchases over $15.00 by using the code "Friends". If you would like to keep up on sales and discounts or other Monkey business you can follow them on twitter or facebook. These sound very kid friendly. I love all the different flavors! I will have to keep my eyes open for these in the store. 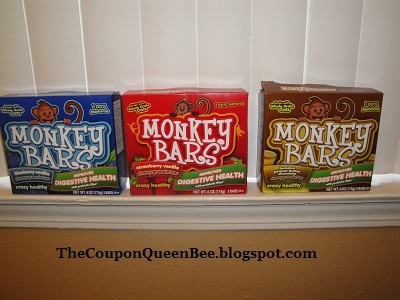 These bars are great-we have been buying them for a few years now and my son loves them! It is so nice to be able to find snacks that are not loaded with chemicals and artificial ingredients! 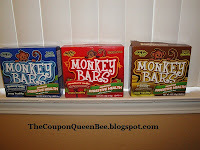 I saw Monkey Bars at Target on sale for $1.99 (for box of 5) - normally they are $2.99 per box. Yay!